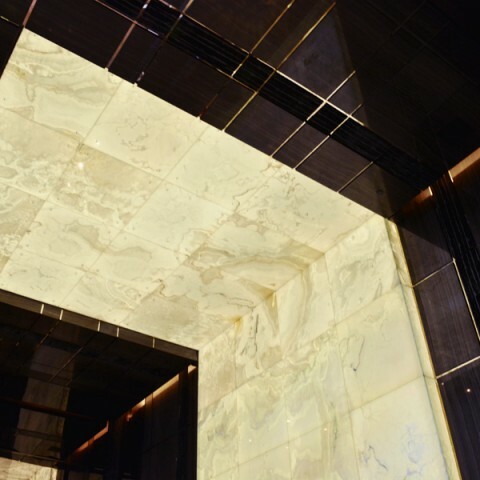 Two backlit onyx ceilings define the VIP dining areas for a private commercial project in Asia. Following the overarching aesthetic goal for the backlit ceilings to appear pure and ice-like, the custom white onyx varieties were selected for their similarities to glacial movement and clouds. But simply selecting the onyx variety is only the beginning step when designing with natural stone. To create the unified composition, the stone patterning of each slab was analyzed and diagrammed to create flow from panel to panel when cut into individual pieces. Installed within the ceiling in its corresponding location, each stone panel is also individually controlled for maximum lighting balance and continuity across the feature as a whole. Coupled with glamourous interior finishes, the visual depth and texture inherent in the natural stone provides a strong focal point anchoring the event spaces.